There always reaches a point in the summer where you have been growing tomatoes and you have eaten them every way possible. You don’t know how else to cook them and yet they just keep coming. Well I know it isn’t summer but over the last few months we had been getting tomatoes in our bountiful basket so often that I was starting to get a bit burnt out. I love tomatoes and had prepared them all the ways I like to enjoy them but was starting to get a bit tired of them. I was on the hunt to find a different way to prepare them and I found this recipe. It is now a new favorite of mine and is great in the colder months because the tomatoes are baked. 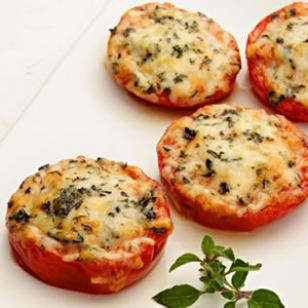 These baked parmesan tomatoes would also be great on a sandwich or just as a side dish. 2. In a small bowl mix together Parmesan cheese, oregano, salt, and pepper. Place tomatoes cut side up on a baking sheet. Top with Parmesan mixture and drizzle with olive oil. Bake until the tomatoes are tender, about 15 minutes.